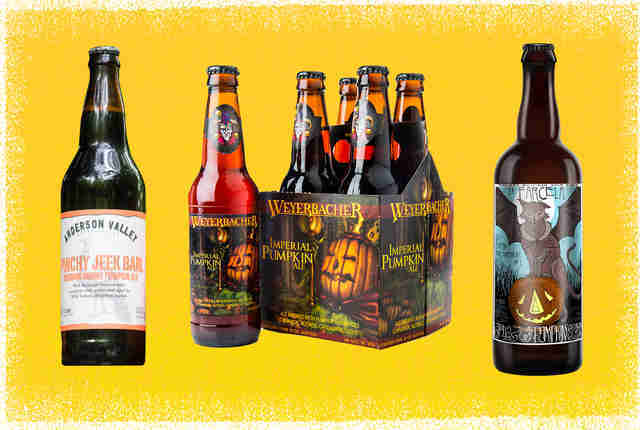 There are so many pumpkin beers on the shelves these days that it's difficult to figure out what's a trick and what's a treat. We’ve done the tough work of drinking the best pumpkin beers in America to ensure your next six-pack is full of sugar, (pumpkin) spice, and everything nice. 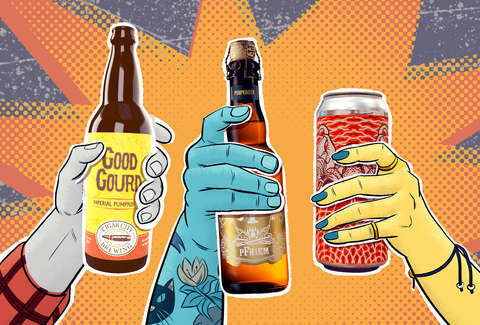 One disclaimer: We didn’t include delicious variants of some of these beers because they’re generally impossible to find -- and what the hell’s the fun in that if you can’t drink it? If a given brewery on this list distributes to your state, you should have a good shot at buying its pumpkin beer. Short of Hunter S. Thompson, nobody does greater things under the influence of Wild Turkey than Anderson Valley, including the coveted Bourbon Barrel Stout. But Pinchy Jeek… well, holy hell. It's basically Thanksgiving in a bottle, provided you usually burn the turkey and just switch to bourbon. It's got all those sweet/spicy pumpkin notes, but kicked in the gobble by six months in a Wild Turkey barrel. Even more alarming is how easy it goes down at 8.5%. For those who chide pumpkin beers for lacking depth, Anderson Valley's barrel-aged masterpiece is here to prove you wrong with layer upon layer of flavor. Pumpkin spice heaven on the nose and the taste buds. The bottle promises "cloves, nutmeg, and cardamom," and they dance on your tongue, as promised. In a sea of seasonal brews with funky ingredients trying to vie for your attention, this stalwart has been on the shelf year after year because of its sterling reputation as a solid pumpkin ale. Jolly Pumpkin has endured years and years of people making jokes about not actually making pumpkin beer, and has finally caved with La Parcela. Unlike fan demand for a second Dumb & Dumber movie, it actually paid off. This beautiful, bubbly oak-aged ale gets all the pumpkin notes right, with a hint of cocoa on the back of the tongue. "Guess now folks will have to find something else to joke about," reads the bottle. All right, JP. How about a Blue Raspberry Jolly Rancher saison?! Bourbon-barrel aging results in enjoyable vanilla notes that permeate the 10% imperial ale. But the aging isn't what propels this beer alone into one of the 21 best -- it's the sessionable factor combined with the pumpkin spices. It's well-spiced, and yet it's also one of the few brews in a large format bottle that's not a challenge to finish. Stevens Point must have just liquified a pumpkin pie and put it in a bottle, because this mimics the pumpkin pie experience better than any beer we’ve tried. Another plus: It's not overly sweet. Expect a host of intense pumpkin pie flavors like nutmeg and cinnamon. A marvelous beer. Elysian offers a bunch of pumpkin beers each year, but after drinking all of them, Punkuccino here is the clear standout. This is an upscale, boozy version of a Pumpkin Spice Latte that is creamy and flavorful down to the last gulp. 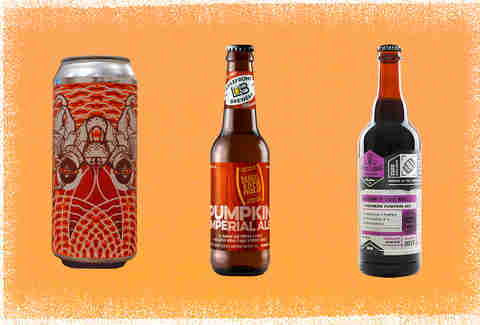 If you’re gonna brew a coffee pumpkin beer in a city as obsessed with coffee and beer as Seattle is, it better deliver. And this does. 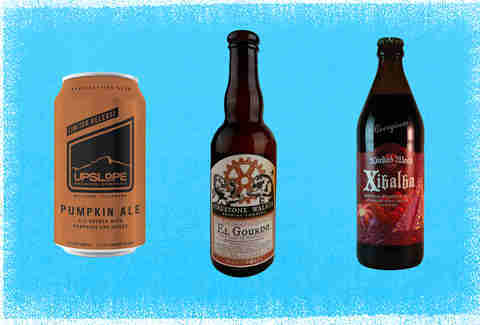 There are a couple of schools of thought when it comes to pumpkin beers. There are those who don't mind a hint of spice, but who get a little bit leery when things veer into liquid pumpkin pie territory. Pumking is not for those people. If you're the type who gets seconds on pie at Thanksgiving and has Pumpkin Spice Latte day marked on your calendar, this is the pumpkin beer for you, one rich with notes of vanilla, nutmeg, cinnamon... and, wait, are you sure they don't make this with pie crust? Good Gourd is often cited as the pumpkin beer against which all others are measured, as it tastes like liquid pumpkin pie. Check the spice list: cinnamon, Jamaican allspice, Zanzibar cloves, vanilla, and nutmeg. And you bet your sweet bippy those spices show up in every sip. It's also 8.8%, so you don't need to drink much of it to get into the Halloween spirit. Also, you can't drink much of it because it only comes in 22-ounce bombers (and on tap, if your state’s bars are lucky enough to carry Cigar City). No conversation about pumpkin beer is complete without Schlafly, which might just be the most well-balanced bottle in the patch. The spiciness on the nose may spook some, but one sip reveals how it's medium-bodied and smooth on the palate, with pumpkin flavors playing along more as an accent than the language. Oh, and the real good news is that it tastes exactly like liquid pumpkin pie. It's what people in the industry call a "converter" beer because even people who hate this style will usually find something they like. Not surprisingly, this makes it a pretty obvious choice for a cooler option at your Halloween party or mid-season tailgate. The ABV on this beer varies from year-to-year (it’s been 17%+ previously), but suffice it to say that no matter the year, this is one to sip and savor. It almost seems wrong to call this a beer. It smells like a bourbon, which makes sense given it was aged in bourbon barrels. It sips like a liqueur. It's incredibly rich, and there are plenty of pumpkin spice flavors in every sip. Perfect to sip on post-Thanksgiving dinner during your granddad's yearly speech about how Eisenhower ruined this country. Turns out not everyone likes Ike. This is the pumpkin beer for people who say they don't like pumpkin beers. It won't overpower you with pumpkinyness, and the finish is quite pleasant. And because it’s brewed by people who always seem to brew beers that sound like that could be absolutely disgusting but always turn out fantastic, you can feel confident that you’re in good hands with a pumpkin pint from Dogfish Head. No brewery should be allowed to be on this list twice, but we’d be wrong to include Pump[KY]n and not this full-bodied, spicy gem that’s every bit as delicious as its bourbon barrel-aged sibling. It also sports a high ABV and is best enjoyed after a long dinner full of turkey eating and arguing. Depending on how close you live to your family, that could be once a year at Thanksgiving or… every Thursday. You could make a solid case for Hoppin' Frog as one of the best -- if not the best -- breweries in Ohio's increasingly outstanding beer scene, so you can bet that when the Akron-based brewers hit the pumpkin patch, the results were magical. Frog's Hollow has the light texture of an ale, but don't let your guard down: There's a strong blast of allspice and pumpkin here, one that rushes over the nose and palate like a crisp fall breeze. Given that Hoppin' Frog made its name on barrel-aged beers like B.O.R.I.S. the Crusher, it's also worth seeking out the barrel-aged version of Frog's Hollow, which adds a few more layers of flavor to the already robust profile. The folks at pFriem have risen to the top of the Oregon beer world thanks in large part to their willingness to tinker with European brewing techniques and emerge with complex, often playful offerings. Pumpkin Bier is a solid example. Like a lot of the brewery's wares, this one leans into the Belgian influence (and yeast), spiking things up with roasted and pureed pumpkins, allspice, nutmeg, and other flavors to emerge with a smooth, light, creamy entry in the pumpkin pantheon. Like most of the offerings that emerge from this Columbia River Gorge favorite, it's a beer that gives you everything you'd expect from a pumpkin beer, with the unexpected flourishes you come to anticipate whenever you see the brewery's distinctive logo. Some might say this is the best pumpkin beer in America. Those someones happened to be beer judges in 2017 for the Great American Beer Festival, where they awarded it gold in the Pumpkin/Squash or Pumpkin Spice Beer category. The brew doesn’t skimp on ingredients, as it’s the most expensive beer they brew, and it shows. It’s a rich, dark, malty treasure overflowing with molasses, brown sugar, pumpkin spices, and enough pumpkins to bake 437 pumpkin pies, according to the brewery. Pro tip: If you’re in Houston and want one, order it in the literal cathedral Saint Arnold opened a couple months ago. It may not be a religious experience, but at 10.5%, it'll certainly have you speaking in tongues. This beer is not trying to be a pumpkin spice latte or pumpkin pie or taste like a pumpkin was left to soak inside of a bottle of Pappy. It’s simply one of the more solid pumpkin brews you’ll ever drink -- after all, it did win gold in 2011 at the Great American Beer Fest in the Field & Pumpkin Beer category. The pumpkin pie spices linger on the palate enough to remind you what you’re drinking, but they’re not overpowering. The strength of this pint is not only in the eminently drinkable brown ale base beer, but in the fact that it’s brewed with baby bear pumpkins from the legendary Boulder agricultural mavens at Munson Farms. Many of the best Colorado restaurants rely on Munson for produce: Upslope is smart enough to utilize its tiny, delicious pumpkins in beer. And us pumpkin brew drinkers are better for it. Even though this beer isn’t called El Scorcho, we still think it’d be good for you and you’d be good for it. The venerable Cali brewery that’s long been thriving in an area known for producing wines has produced this brew that takes a little more time to mature than others: Last year’s variant was aged for 24 months in French oak barrels with roasted, caramelized Cinderella pumpkins, laurel leaf, and walnuts. It’s not quite as easy to find as some other beers on the list, but this complex, funky beast is worth the hunt. There are some pumpkin and chile beers that are actively trying to scorch your mouth at the expense of, you know, flavor. Thankfully, this is not that. You’ll love the familiarity of a dark pumpkin spice ale, but with added warming notes from ancho and habanero chile peppers and the welcome addition of cacao. Oh, and if you can get your hands on the barrel-aged variant of this, you should. Pro tip: Asheville-based Wicked Weed’s Funkatorium bar has an attached beer shop where you can find plenty of rarities. OK, so this isn’t the easiest beer to acquire. But if you live near the Philly burbs, are down to follow Tired Hands’ busy/delicious Instagram for the brewery’s new releases (this beer debuted in October last year), and love unique pumpkin beers, this is the one for you. It’s the pumpkin entry in the brewery’s Culinary IPA series, a groundbreaking blitz of beers that combines loads of fruit and lactose for a creamy, hoppy treat. Check it: You get malted oats, real pumpkin, lactose sugar, pumpkin spices, vanilla bean, and their coffee. It was made in conjunction with the Swedish brewery Omnipollo. If you can’t find it in PA, it may be worth the trip to Sweden to see if they have a few extra. One of the OG Wisconsin breweries shows that an old dog can do new tricks, especially if that dog is also a brewmaster skilled at aging beer. And just this past July, the judges at the US Open Beer Championship deemed it worthy of a silver medal. We understand why: There’s the standard liquid-pumpkin-pie vibe courtesy of the spice blend, but layering atop a boatload of vanilla notes and a boozy brandy finish turns this into something truly special. The BL folks are no strangers to (*alliteration warning!) barrel-aging brews in bourbon barrels (Resplendent Angel, Fundamental Observation), so it makes sense that they’d wanna chuck a bunch of pumpkins into Four Roses and Heaven Hill barrels for seven months and see what happens. Two hundred-plus pounds of pumpkins to be exact! Why, that’s how much a human man weighs! After all, when you’re trying to brew liquid pumpkin pie, you need to use plenty of the real thing. And as good as the beer will taste in 2018, Bottle Logic encourages you to age this brew in a cellar and enjoy it sometime in the near future. Our recommendation? Buy two. 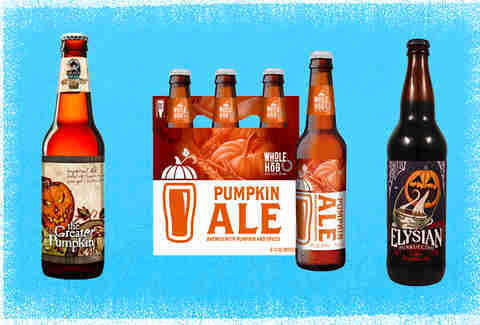 Throw one in the cellar and drink the other tonight to maximize your fall fun. 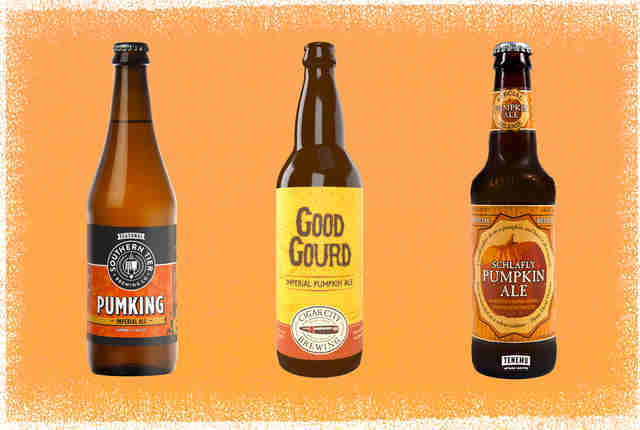 Lee Breslouer writes about food and drink for Thrillist, and thinks Good Gourd also comes in #1 for pumpkin beer-related puns. Follow him at @LeeBreslouer for pumpkin-scented tweets. Matt Lynch, Andy Kryza, and Zach Mack contributed to this list.